W artykule przedstawiono wyniki badań mikrostruktury powłok natryskiwanych metodą płomieniowo-proszkową mieszaninami proszków NiMoAl/ZrO2-30% CaO oraz NiAlMo/Al2O3-40% TiO2. Skład fazowy określono metodą XRD i wykazano, że w powłoce ZrO2 – 30% CaO występują fazy ZrO2 oraz CaZrO3, a w powłoce Al2O3-40% TiO2 – β tytanian glinu, korund, rutyl. Porowatość powłok cermetalowych zależała od składu proszków zastosowanych do natryskiwania. 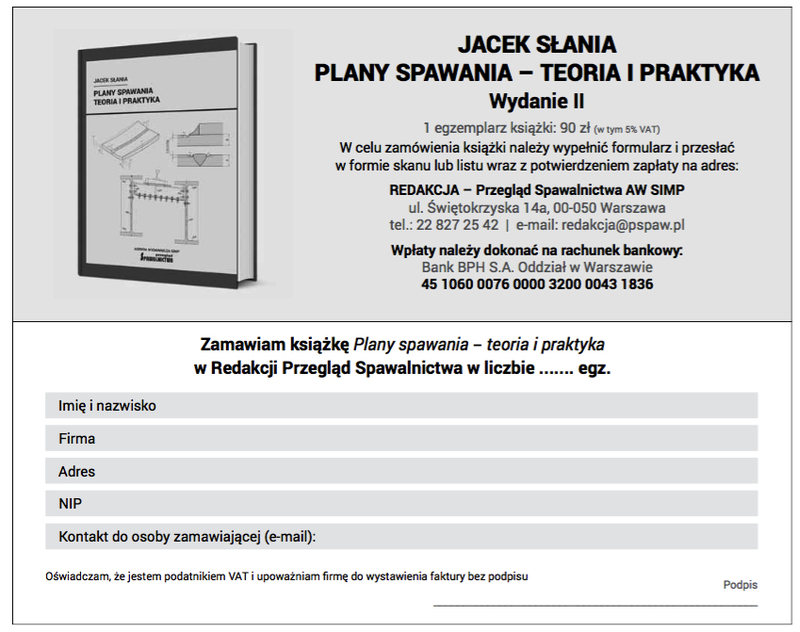 Wartości parametrów struktury geometrycznej powierzchni malały ze wzrastającą zawartością materiału ceramicznego. Dodanie do materiału bazowego tworzącego osnowę cermetalu niewielkiej ilości innego materiału zmienia mechanizm formowania powłoki. The paper presents results of microstructural investigations of coatings flame sprayed with the mixtures of powders nimoAl/ZrO2-30% CaO and niAlmo/Al2O3-40% TiO2. Phase composition was evaluated by means of the XRD method. The phases which appear in the ZrO2-30% CaO coating are ZrO2 and CaZrO3, whereas in the Al2O3-40% TiO2 coating – β aluminium titanate, corundum and rutile. Porosity of cermet coatings depends on the composition of powders used for spraying. The values of parameters describing the geometrical structure of the coating surface decreased with increasing ceramic content. The admixture of low content of other material to the matrix- creating base material changes the mechanism of the coating formation. Hejwowski T.: Studium procesów zużywania erozyjnego, ściernego i zmęczenia cieplnego elementów maszyn oraz kształtowanie struktur o korzystnych właściwościach eksploatacyjnych. Wydawnictwa Politechniki Lubelskiej, Lublin 2003. Mc Pherson R.: A review of microstructure and properties of plasma sprayed ceramic coatings. Surface and Coatings Technology 39/40 (1989). Li C., Ohmori A., mcPherson R.: The relationship between microstructure and Young’s modulus of thermally sprayed ceramic coatings. Journal of materials Science 32 (1997). Li C.-J., Ohomori A.: The lamellar structure of a detonation gun sprayed Al2O3 coating. Surface and Coatings Technology 82 (1996). Hejwowski T.: Comparative study of thermal barrier coatings for internal combustion engine. Vacuum 85 (2007). Jin Z-H., Batra R.C. : Thermal shock cracking in a metal-reinforced ceramic matrix composite. Engineering Fracture me- chanics 62 (1999). Gudmundsson B., Jacobson B., Berglin L., L’Estrade L., Gruner H.: microstructure and erosion resistance of vacuum- plasma-sprayed Co-Ni-Cr-Al-Y/Al2O3 composite coatings. materials Science and Engineering A108 (1989). Wang B., Lee S.W. : Erosion-corrosion behavior of HVOF NiAl-Al2O3 intermetallic-ceramic coating. Wear 239 (2000). Ramm D.A.J., Hutchings I.m., Clyne T.W. : Erosion resistance and adhesion of composite metal/ceramic coatings produced by plasma spraying. Journal de Physique IV 3 (1993). Mahesh R.A., Jayaganthan R., Prakash S.: microstructural chracteristics and mechanical properties of HVOF sprayed niCrAl coating on superalloys. Journal of Alloys and Compounds 468 (2009). Mahesh R.A., Jayaganthan R., Prakash S.: microstructural characterization and hardness evaluation of HVOF sprayed Ni-5Al coatings on Ni- and Fe-based superalloys. Journal of materials Processing Technology 209 (2009). Hejwowski T.: Degradation of aluminium titanate based TBC in thermal fatigue and diesel engine tests. Applied Plasma Science (12) 2004. Górski L.: Przemiany fazowe w materiałach ceramicznych na bazie Al2O3 w warunkach natryskiwania plazmowego i wygrzewania stacjonarnego – część II – układ Al2O3-TiO2. Inżynieria materiałowa (1995) 1. Brandt R.: Thermal diffusivity measurements on plasma-sprayed Ca-stabilized ZrO2. High Temperatures – High Pressures 13 (1987). Chwa S.O., Klein D., Toma F.L., Bertrand G., Liao H., Coddet C., Ohmori A.: microstructure and mechanical properties of plasma sprayed nanostructured TiO2-Al composite coatings. Surface and Coatings Technology 194 (2005). Schwingel D., Taylor R., Haubold T., Wigren J., Gualco C.: mechanical and thermophysical properties of thick PYSZ thermal barrier coatings: correlation with microstructure and spraying parameters. Surface and Coatings Technology 108-109 (1998). Sodeoka S., Suzuki m., Ueno K., Sakuramoto H., Shibata T., Ando m.: Thermal and mechanical properties of ZrO2-CeO2 plasma sprayed coating. Journal of Thermal Spray Technology 6 (3) (1997). Alcala J., Gaudette F., Suresh S., Sampath S.: Instrumented spherical micro-indentation of plasma sprayed coatings. materials Science and Engineering A316 (2001). Fervel V., normand B., Coddet C.: Tribological behavior of plasma sprayed Al2O3-based cermet coatings. Wear 230 (1999). Pan C., Xu X.: microstructural characteristics in plasma sprayed functionally graded ZrO2/niCrAl coatings. Surface and Coatings Technology 162 (2003). Sampath S., Jiang X.Y., matejicek J., Leger A.C., Vardelle A.: Substrate temperature effects on splat formation, microstructure development and properties of plasma sprayed coatings. Part I: Case study for partially stabilized zirconia. materials Science and Engineering A272 (1999). Kurella A., Dahotre n.B. : Laser induced multi-scale textured zirconia coating on Ti-6Al-4V. J. mater. Sci: mater med 17 (2006). Li J.F., Li L., Stott F.H. : Fractal characteristics of apparent pores present on polished cross sections of alumina coatings prepared by laser-assisted flame hybrid spraying. Thin Solid Films 453-454 (2004). Celli A., Tucci A., Esposito L., Palmonari C.: Fractal analysis of cracks in alumina-zirconia composites. Journal of European Ceramic Society 23 (2003). Amada S., Hirose T.: Planar fractal characteristics of blasted surfaces and its relation with adhesion strength of coatings. Surface and Coatings Technology 130 (2000). Reisel G., Heimann R.B. : Correlation between surface roughness of plasmas-prayed chromium oxide coatings and powder size distribution: a fractal approach. Surface and Coatings Technology 185 (2004).